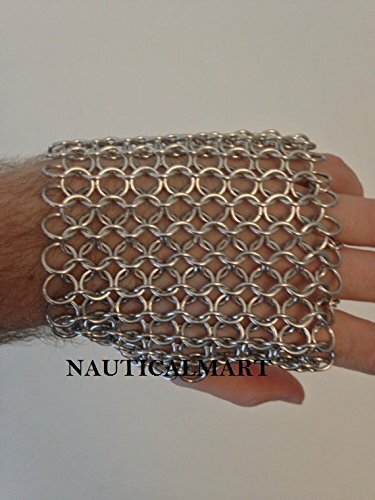 Butted 16g 5/16" & 18g 3/16" saw cut bright aluminum rings were used to create this lightweight fingerless European 4/1 chainmail glove. This glove would work well for concert wear, part of a larp costume or some other role. Because this is a sealed ring of maile this piece is designed to slide on over your hand, pictures show it on the skin but you could also have this over leather or other padding for more protection and a bit more authentic look. Measure your hand with any glove or padding on to see what diameter you need to order, if your size is not listed send me a message and we can make a custom order.